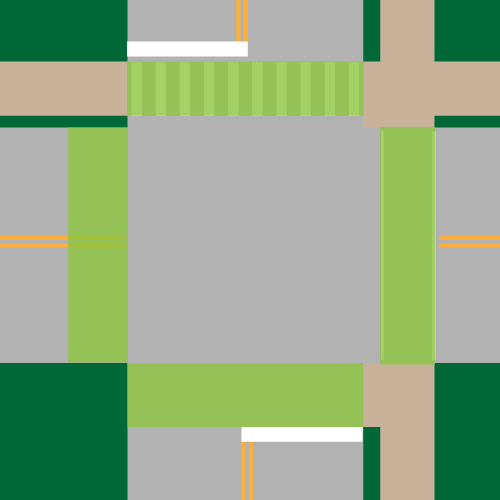 All sides of the intersection are crosswalks — marked or not, regardless of whether the sidewalk is paved or not. 316.2065 (9) A person propelling a vehicle by human power upon and along a sidewalk, or across a roadway upon and along a crosswalk, has all the rights and duties applicable to a pedestrian under the same circumstances. 316.2065 (10) A person propelling a bicycle upon and along a sidewalk, or across a roadway upon and along a crosswalk, shall yield the right-of-way to any pedestrian and shall give an audible signal before overtaking and passing such pedestrian. Bicycles can be legally operated on all Florida sidewalks and crosswalks unless a local ordinance prohibits it. When on a sidewalk, the operator is operating a vehicle and must use helmets and lights when required, and is subject to the DUI laws. Otherwise, the operator has the rights and duties of a pedestrian, but must yield to all pedestrians. The rights and duties of pedestrians are explained in more detail at Best Foot Forward, an Orlando-based initiative for pedestrian safety. CommuteOrlando offers a visual primer on crosswalk challenges. Question John asked: Are electric scooters allowed to drive on the sidewalk while going over a bridge? Question Robert asked: When sharing the sidewalks with bikers, do I walk against or with the traffic? Question Don asked: What about operating an Electric motorized wheelchair on a sidewalk down a state route in Florida?